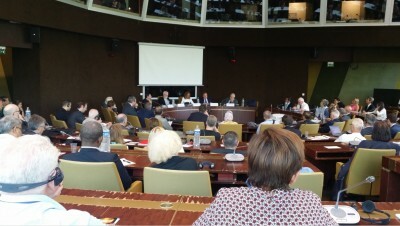 *Strasbourg/CoE/Angelo Marcopolo/- During a Well-Attended Symposium, in a Full Conference Room at the "Palace of Europe" in Strasbourg, an exceptional Cooperation between the PanEuropean CoE and the Vatican, on the occasion of the 70th Anniversary of the Universal Declaration for Human Rights (1948-2018), focused into demonstrating how Topical is, in fact, the issue of the "Universality of Human Rights" Nowadays, at the Eve of 2 particularly Important Sessions organized in Parallel by the UNO at nearby Geneva, and by the CoE here in Strasbourg, on Monitoring several "Hot" Cases of Human Rights' Violations both in Europe and across the World. Emeritus Professor at Panthéon-Assas University, Paris II, Emmanuel Decaux, who has played an important role for the adoption of UNO's landmark International Convention on the Drama of "Missing" Persons, and still is a Key Member of the World Council on Human Rights in Geneva, reminded, inter alia, how even the Spiritual Father of the European Convention of Human Rights, René Cassin, (whose Institute is located in Strasbourg), had strived to promote the Universality of Human Rights at an International Level, being against the risk to practically restrict them, more or less, only inside Europe. 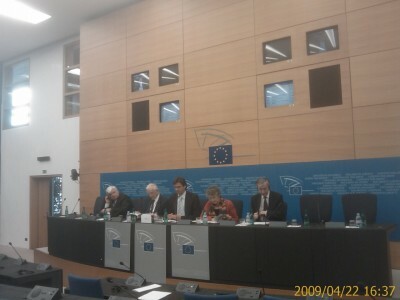 The President of the PanEuropean Court of Human Rights, (involving 47 Member States), Guido Raimondi, observed, inter alia, that the relevant European Convention clearly Protects Any Person living in the jurisdiction of CoE's Member Countries, already from its 1st Article, and that Governments are Responsible not only inside their National Territories, but also in Other Areas which may come under their "Control". Moreover, a recently developed "Judges' Diplomacy", by bringing often Together the main Regional Human Rights Courts of Various Continents in the World, can Help to develop common Standards. 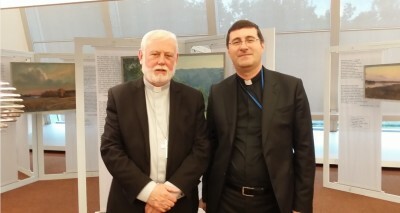 Vatican's "Foreign Minister", Archbishop Paul Richard Gallagher, (who knows personally quite well Strasbourg), Warned against 3 main Challenges faced Nowadays by the Universality of Human Rights : (1) Certain Economic Policy Views which are against Social Inclusion, (2) Claims that Multi-Culturalism might allow for Exceptions on Human Rights, and (3) Cases of States or Areas where Serious and Massive Violations of Human Rights have been Tolerated for too long. He concluded mainly by Focusing on Pope Francis' key concept of "Integral Human Development", closely linked with the traditional Christian conception of "Human Dignity", "based on the Natural law inscribed on Human Hearts, and present in Different Cultures and Civilizations", as also his predecessor, Emeritus Pope Benedict had said during a Previous Anniversary of the International Declaration for Human Rights, at UNO's General Assembly, Back on 2008, in order to fight against Dangers of "Relativism". Despite (or, perhaps : Because of...) an Exceptionally fertile and Timely context of Manifold on-going Developments involving "Hot" Issues of Human Rights, these Days, both inside the CoE (f.ex. 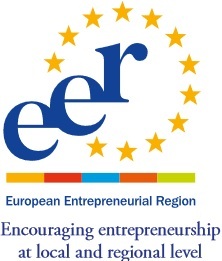 : its Comittee of Ministers' supervision of the execution of ECHR's judgments next week in Strasbourg), and the UNO, (f.ex., the Beginning of the Annual Session of the World Council for Human Rights at nearby Geneva from this week), as well as in EU Parliament, (f.ex., among others, also a Controversy about the real situation in Hungary, etc, debated on Tuesday and Wednesday during this Weekly Plenary in Strasbourg, etc), surprisingly, Contrary to what had happened in the Past, when Mgr. Gallagher had visited the CoE at a Previous, Different Occasion, this Time there was No Press-Point organized. 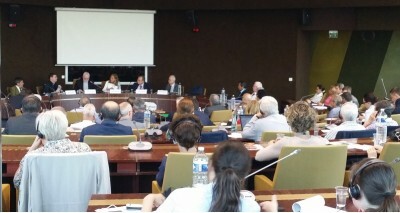 Nevertheless, well-informed Vatican's sources, speaking "off the record" with "Eurofora", awknowledged the fact that a Serious Challenge for Human Rights Nowadays, having a Universal Character, are the Risks that may present eventual Abuses of Modern Genetic Technologies, particularly after the Recent, Controversial Discoveries also of "Gene Editing", whose Present and Future depend, inter alia, also from the development of Scientists' "Consciousness".